A sarce and beautiful map of Paris, France. Le Plan de Paris ses Faubourgs et ses Environs. 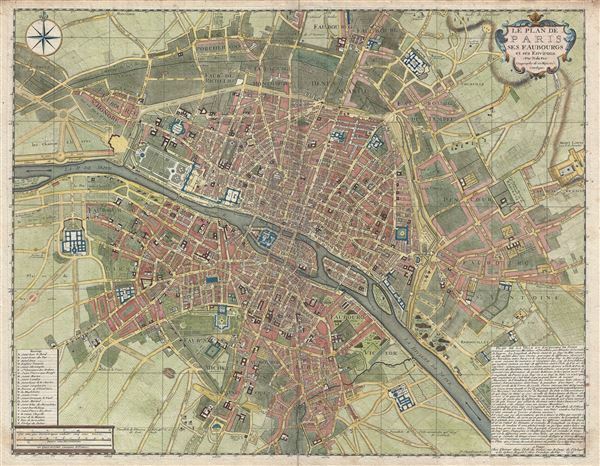 A fine example of De Fer's scarce and beautiful 1717 map of Paris, France. Centered on the Seine River, the map covers from Ile aux Cygnes to Mont Louis, and from Les Porcherons to Le Gaubourg Saint-Marceau. All streets, gardens, important buildings, palaces, some topography, and estates are noted. De Fer first issued this map in 1707, and by 1720, it had been adapted by Delisle, who retitled and updated it substituting in the process his own imprint. The present example, issued in 1717, is one of the last De Fer issues of this stunning map. The map was engraved by P. Starckman for De Fer in 1717. Nicholas de Fer (1646 - October 25, 1720) was a French cartographer and publisher, the son of cartographer Antoine de Fer. He apprenticed with the Paris engraver Louis Spirinx, producing his first map, of the Canal du Midi, at 23. When is father died in June of 1673 he took over the family engraving business and established himself on Quai de L'Horloge, Paris, as an engraver, cartographer, and map publisher. De Fer was a prolific cartographer with over 600 maps and atlases to his credit. De Fer's work, though replete with geographical errors, earned a large following because of its considerable decorative appeal. In the late 17th century, De Fer's fame culminated in his appointment as Geographe de le Dauphin, a position that offered him unprecedented access to the most up to date cartographic information. This was a partner position to another simultaneously held by the more scientific geographer Guillaume De L'Isle, Premier Geograph de Roi. Despite very different cartographic approaches, De L'Isle and De Fer seem to have stepped carefully around one another and were rarely publicly at odds. Upon his death of old age in 1720, Nicolas was succeeded by two of his sons-in-law, who also happened to be brothers, Guillaume Danet (who had married his daughter Marguerite-Geneviève De Fer), and Jacques-François Bénard (Besnard) Danet (husband of Marie-Anne De Fer), and their heirs, who continued to publisher under the De Fer imprint until about 1760. It is of note that part of the De Fer legacy also passed to the engraver Remi Rircher, who married De Fer's third daughter, but Richer had little interest in the business and sold his share to the Danet brothers in 1621. P. Starckman (fl. c. 1680 - 1730) was a Hague based engraver active in the late 17th and early 18th centuries. Starkman engraved for numerous cartographers as well as on his own account, usually signing his work as P. Starkman Fecit. Most of his work focuses on the cartography of De Fer, Delisle, and Desnos. His first name is not known. Very good. Some edge light centerfold wear. Blank on verso. Original platemark. OCLC 777474767. Boutier, J., Les Plans De Paris, 193. Vallee, Leon, Catalogue des plans de Paris et des cartes de l'ile de France, (Bibliotheque Nacionale) 829.